Damen Shiprepair Rotterdam (DSR), part of Damen Shiprepair & Conversion, said it has completed maintenance and repair works on the newest member of CMV’s fleet, the cruise ship Columbus. The full work scope was concluded within a tight timescale, thus ensuring that the vessel could sail to the London Cruise Terminal in Tilbury, U.K. in time for her naming ceremony and inaugural cruise. Several CMV vessels – the Astor, Marco Polo and the Magellan, for example – have made calls at various Damen repair yards in the past. The sheer size of the Columbus, however, meant that DSR was the suitable yard of choice in this instance. “Not only is the Columbus 245 meters long, she also has a draught of 8.2 meters,” explained DSR Project Manager Vincent van Rulo. “For such vessel dimensions, the facilities that we have here at DSR are ideal." 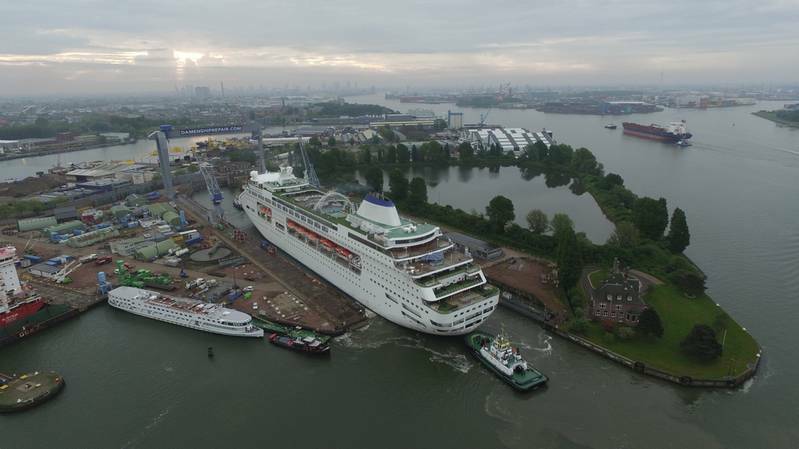 The Columbus arrived at the Rotterdam yard on May 13, and departed just over three weeks later on June 5. With the overall aim of bringing the vessel into line with CMV’s operational standards, Damen carried out a scope of maintenance and repair jobs. “After docking, we started straight away with a complete painting program. This included the application of the company logos and markings of the new owners,” van Rulo said. Technical aspects included maintenance of the main engines, generators and thrusters as well as polishing of the ship’s propellers. Numerous valves and pipelines of various ship’s systems were maintained and renewed or modified if required. The work also included maintenance of all lifeboats, tenders and davits in addition to cleaning and repair of ship’s tanks. 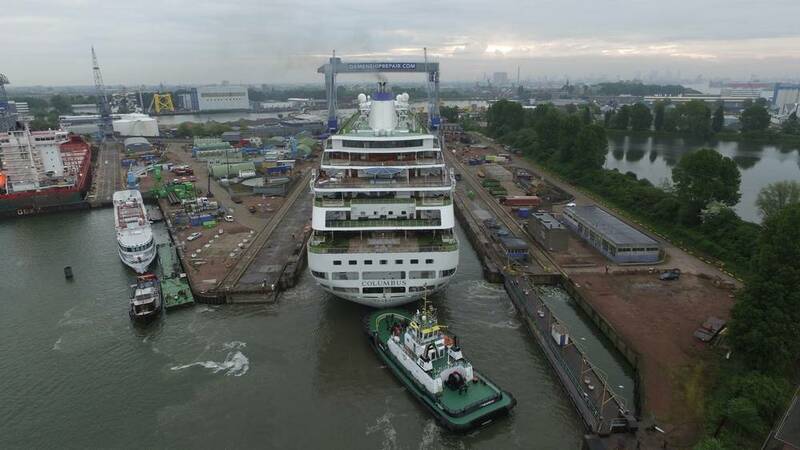 “The key part of this contract was that we had a fixed timescale – the Columbus had to be in Tilbury for her naming ceremony and then to receive her first guests on June 11,” van Rulo noted. “This called for anticipation and fast reaction to all issues that we came across.” Such issues were diverse in nature; ranging from organizing the repair of the ship’s washing machines to the inspection and calibration of the passenger embarkation security and detection systems. Damen noted that the complexity of the project was heightened due to the fact that up to 700 crew members were staying on board while the ship was docked at the yard. 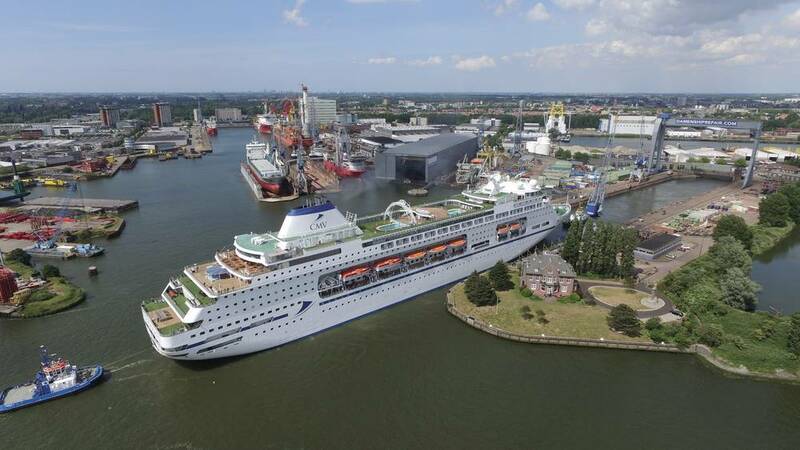 This substantial team of people was carrying out refitting and refurbishment of the vessel’s accommodation, shops, restaurants and recreational areas. Their work also included handling the final supplies and other preparations for the vessel’s first cruise. “While this added to the logistical challenges of the project, we had good communication and organized everything with the ship’s crew so that we all could get the job done within the timeframe,” van Rulo said. 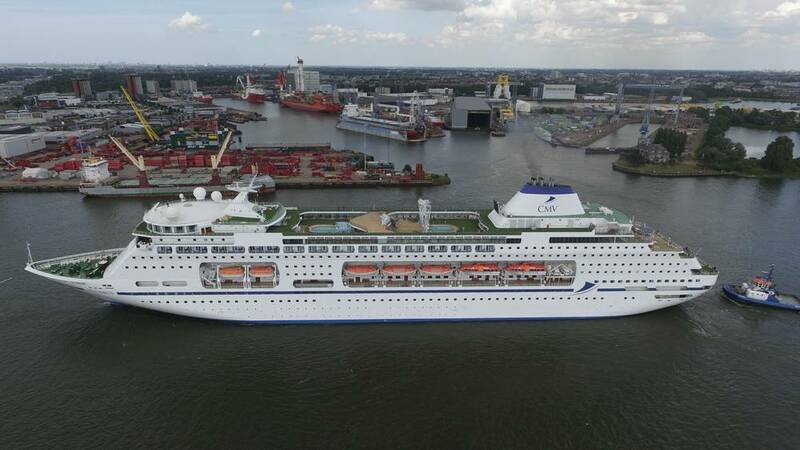 Since leaving Rotterdam, the Columbus is currently sailing on her first cruise under the CMV flag.